Sigh. 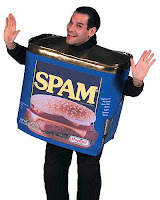 The pooring of America has taken a very dark form - the return of Spam. Now the way the government reports inflation they have a cute thing called "substitution" - when something gets too expensive (beef) their measurements assume you move down (substitute) to a lower value item (say... spam) - so hence your inflation is flat or maybe even goes down. That's the magic of government reporting. Dicks Sporting Goods (DKS) - while this is a Wall Street favorite this is exactly the type of product that a poorer America will have to cut back spending on. So instead of going out and playing golf or sports that actually require exhaling at a fast rate, we will continue to sit on our behinds and play video games from Gamespot (GME). And instead of eating healthy, we'll be eating cheap - such as SPAM from our friends at Hormel (HRL). The price of Spam is up too, with the average 12 oz. can costing about $2.62. That's an increase of 17 cents, or nearly 7 percent, from the same time last year. But it's not stopping sales, as the pork meat in a can seems like a good alternative to consumers. Kimberly Quan, a stay-at-home mom of three who lives just outside San Francisco, has been feeding her family more Spam in the last six months as she tries to make her food budget go further. She cooks meals like Spam fried rice (cringe!) and Spam sandwiches two or three times a month, up from once a month previously. Spam's maker, Hormel Foods Corp., reported last week that it saw strong sales of Spam in the second quarter, helping push up its profits 14 percent. Spam sales were up 10.6 percent in the 12-week period ending May 3, compared to last year. Also helping sales, executives said in an earnings conference call, was the fact that people looking to save money are skipping restaurant meals and eating more at home. The pooring of America continues - and yet another reason to bet against all forms of discretionary spending that focuses on the lower 2/3rds of America, especially [Stuff I've been Negative on Since Last Fall]. Even the bottom portions of the top third are going to be slowly forced away from the Whole Foods Market (WFMI) they hold near and dear [May 14: Whole Food Markets at a Loss of Why Sales are Slowing] They're heading for Spam-a-lot. While sad to see, they still have it a lot better than many in the developing world which would kill for.... Spam. And just think. We're not even in a technical recession! Gosh, what's going to happen when (if) we ever enter one (not that government reports will show it). Anyhow, onward and upward to that 2nd half recovery - July 1, 2008; only weeks ago. Spam & Kool Aid! Yummy!